Had Teresa Dzieweczynski chosen to publish her recent findings as an updated children’s classic, rather than as a research paper, she could have titled it If You Give a Fish an Antidepressant. The book would probably be less charming than If You Give a Mouse a Cookie. But it would also be, unfortunately, more realistic. Our pharmaceuticals are steadily trickling into the homes of fish and other animals. And—as the hero of the original book could have told us, his house in disarray after fulfilling the whims of a hungry rodent—there are consequences. Dzieweczynski, a psychologist at the University of New England, looked at just one of the drugs that’s crept into American waterways: fluoxetine, better known as Prozac. It’s an antidepressant that makes the hormone serotonin linger in the brain for a longer time. Antidepressants of this type are commonly prescribed, and they commonly get into the water as a result. They’ve turned up in wastewater, drinking water, and other aquatic environments. 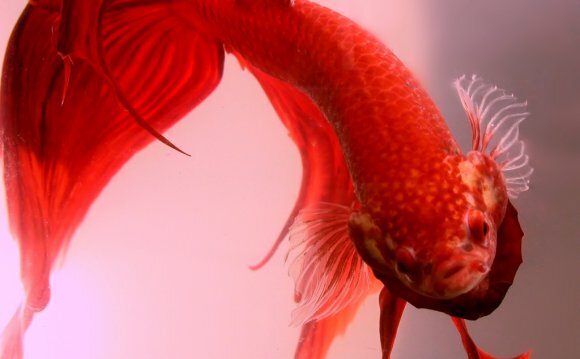 She tested fluoxetine on male Siamese fighting fish, or Betta splendens. No one knows how much Prozac is in the water in Thailand, where these fish live naturally. But they make a good model, Dzieweczynski explains, because scientists already understand a lot about their brains, behavior and hormones. Dzieweczynski and her coauthors put the fighting fish into three different lab environments. Some of the fish swam in tanks with clean water. Others swam in water with a low concentration of fluoxetine—0.5 micrograms per liter, which is at the higher end of what’s been found in U.S. waterways. The third group of fish swam in a stronger dose of fluoxetine, 5 micrograms per liter. The researchers gave the fish behavioral tests to see how bold they were. In one test, they put a fish into a big empty tank and watched how far it roamed. In another test, they dropped a fish into a tank with rocks and artificial plants it had never seen before, and observed it again. How much did the fish explore? Was it curious about its new environment, or cautious and still? Finally, researchers put a fish into a clear tank adjacent to one that held three other fighting fish. Did the subject approach the strangers, or stay at the opposite end of its tank? After getting baseline behavioral scores for all their fish, the researchers started dosing them with fluoxetine. They retested the fish after a day of drug exposure. After a week of drug exposure, they tested them again. Then they put all the fish into clean water for a week and tested them a final time. Across all the behavioral tests, fish exposed to the antidepressant were less bold. They stayed in one place, explored their environment less, and were more hesitant to approach other fish. Their behavior was also more erratic. A higher dose of the drug caused a more dramatic effect. “Perhaps most importantly and alarmingly, ” the authors write, they could still see these effects after the fluoxetine was gone. Even after a week of swimming in clean water, drugged fish behaved less boldly than normal. Dzieweczynski didn’t test her “fighting” fish to see how much they actually fought each other. She says other studies have shown that fluoxetine makes them less aggressive. When the fish in this study approached strange fish from across their tank, they may have been seeking a fight, a potential mate, or just safety in numbers. But no matter what the fishes’ intentions, acting less boldly could hurt their odds of survival in the wild. If fish are less eager to explore their environments, they might have trouble searching for food. Shyer behavior could also make it harder for fish to defend their environments, migrate, or escape predators.